Žižka helped develop tactics of using wagon forts, called vozová hradba in Czech or Wagenburg by the Germans, as mobile fortifications. When the Hussite army faced a numerically superior opponent they prepared carts for the battle by forming them into squares or circles. The carts were joined wheel to wheel by chains and positioned aslant, with their corners attached to each other, so that horses could be harnessed to them quickly, if necessary. In front of this wall of carts a ditch was dug by camp followers. The crew of each cart consisted of 16-22 soldiers: 4-8 crossbowmen, 2 handgunners, 6-8 soldiers equipped with pikes or flails (the flail was the Hussite "national weapon"), 2 shield carriers and 2 drivers. + The idea of 'twenty years on' really resonated with me, and I thought back to what I was doing twenty years ago – namely playing Advanced Heroquest and watching Conan the Barbarian with my brother. 'Now there's an idea,' I thought; and started gathering things together. 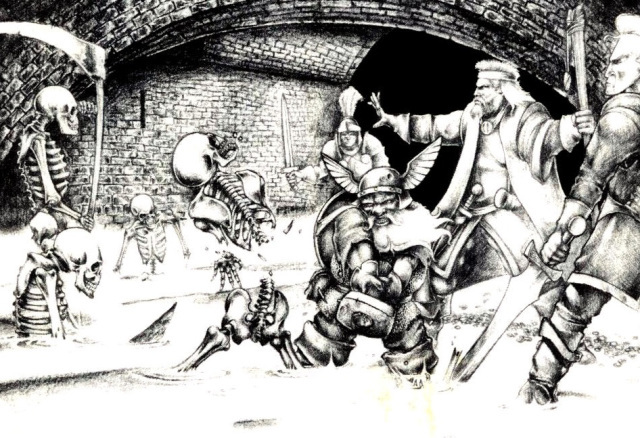 The following are a few scribbled thoughts as visions of Advanced Heroquest, Heroquest and Warhammer Quest all got a bit bashed together. Hope you enjoy; and I hope to bring some proper models together to show soon. Can't all be planning, after all! Heinrich Löwen (the fighter) – old and grizzled; Champion in charge of a group of henchmen. Scrubby beard; missing eye? Sven Hammerhelm (the Dwarf) – Champion in charge of another group of henchmen. Imperial Dwarf with ruffs and puffs, or stern classic? Magnus the Bright (the wizard) – senile (NPC); bathchair? Barbarian from Heroquest – Ogre Bodyguard NPC? Use this shield design – update with Mordheim skull-headed crow? Viginti – Twenty years on; aggressive sounding. Spiky. Scherpunkt – critical point. Punky puns. [T]he most warlike of commanders and those who have accomplished most by a union of daring and cunning, have been one-eyed men, Philippus, Antigonus, Annibal, and the subject of this Life — Sertorius; he whom one may affirm to have been more continent as to women than Philip, more true to his friends than Antigonus, more merciful to his enemies than Annibal, inferior in understanding to none of them, but in fortune inferior to all; and, though he always found Fortune more hard to deal with than his open enemies, yet he proved himself her equal by opposing the experience of Metellus, the daring of Pompeius, the fortune of Sulla, and the power of the whole Roman state; a fugitive and a stranger putting himself at the head of barbarians. Ratspike Ian Miller – greens and blacks; Rembrandt – deep rich darks; reds and yellows. Touch on three-dot yellow-ochre used on Unfortunus Veck – perhaps servo-souls? Punk stylings. Leather jerkins; grubby metal. Pastel pinks? Outré exorbitant fabrics utterly spoiled in the City. 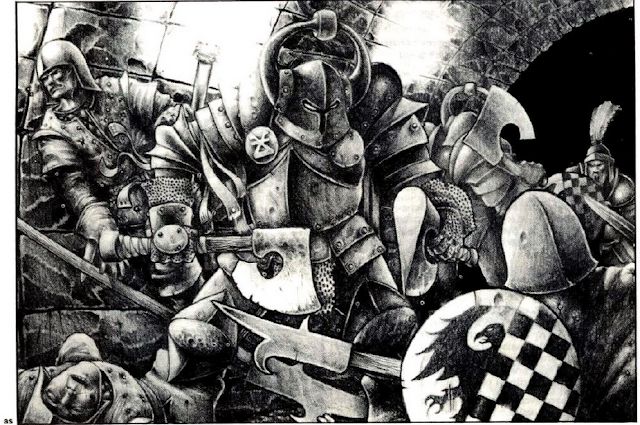 The idea of some older adventurers going out for "one last ride" in a setting like Mordheim sounds really interesting. Looking forward to seeing how to you portray the Barbarian and the wizard (maybe use one of the guard sanctioned pyskers as a base to represent the Wizard struggling to remember where he put his spellbook. I just read a book that has as its basis the old group getting together to perform one more valiant deed (or more likely die trying). [+noosphericinloadlink embedded+] Making everyone seem old through paint is certainly within your skill level, and you could of course add some paunch and curved spines to make the bare models feel old too (Skaven bodies?). And congratulations on reaching the 500th posting. Truly an amazing body of work is represented by that. Oh brilliant idea - very Baron Von Muchausen and his quest to gather up his old crew for one last adventure. :D Looking forward to this!